Happy Thursday, everyone! 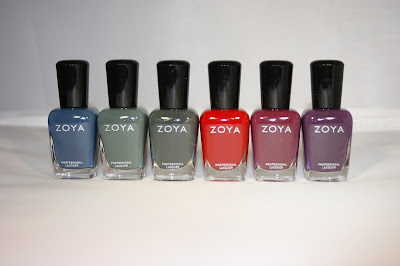 I am SO excited to bring to you the first of the three Fall collections from Zoya! This is the Designer Collection, chock full of gorgeous, luscious cremes! See? They're to DIE FOR! Evvie (yes, like the Pokemon!) was originally featured in the Limted Edition Peter Som Trio back in the spring for New York Fashion Week. A gorgeous eucalyptus creme, I'm so glad everyone now has a chance to get their hands on her! 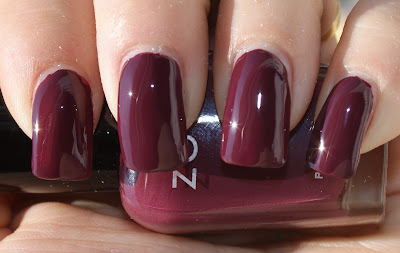 Monica is a rich plum creme polish that dries with a beautiful shine. There is no top coat over this polish. I repeat. THERE IS NO TOP COAT OVER THIS POLISH! Next up is Natty, a dusty cornflower blue. This definitely has some slight gray undertones to it, but it's makes it more unique for sure. Noot is a blackened pine creme nail polish that definitely changes in the light. I don't mean that it's a duochrome, I mean that it takes on a more pine color outside, a more black tone indoors. Toni is a cranberry creme polish that reminds me of Thanksgiving! No Turkey Day is complete without cranberry sauce and no Fall season is complete without Toni! Last, but far from least is Rekha. A siren red creme from the LE Bibhu Mohapatra Trio, I was so excited to see this in the Designer Collection because I had missed out on it way back when and had been lemming it ever since. It is just stunning. I feel like such a badass when rocking this color, I can't even explain! The application on this collection was stellar and I think Evvie's formula is much improved from its original release. Rekha, in my opinion, is the true stunner of this collection, with Monica a close second. The shine on these ladies is also top notch. The Designer Collection is currently available for $48 or $8 per bottle on Zoya.com. All Zoya polishes are now 5-free and are also available at your local Ulta. Stay tuned for the Diva and Gloss Collections! What do you think of these babies? Wow, the shine on these cremes is amazing, and the colours are so rich! Deeper but not murky or muted at all. Thanks for the pics!